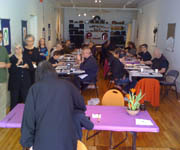 Welcome to the VZ Arts web page! VZ Arts aims to embody the name of our zendo –œDotoku-ji– (True Expression Temple) through the practice of various art forms, including visual art, music, film and theatre. 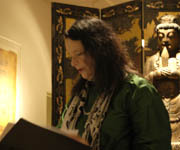 VZ Arts aspires to unite the artists of our sangha; to plan special events such as concerts, art openings, poetry readings and art study groups; and to create a unique community arts space guided by the themes of our Zen Buddhist practice. 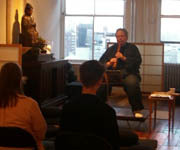 All of our events are planned and produced by Village Zendo sangha members and are directed towards the interests of our Zen community. 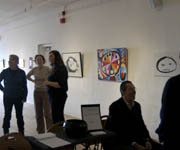 If you have an idea for an event that would benefit our group, then please contact VZArts@gmail.com. 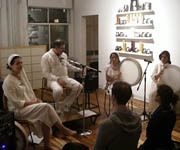 Sound of Zen Poetry: featuring Aaron Ryuko Shragge & Ben Monder duo and Theo Bleckmann & Ben Monder duo. An Evening of Duos with: Aaron Ryuko Shragge & Ben Monder and Theo Bleckmann & Ben Monder, Friday April 25, 8pm. 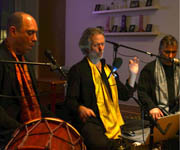 Michele Brangwen Dance Ensemble & Tim Hagans and Jukkis Uotila Duo, Friday January 17th, 8pm. Villagers and Trumpet 3: An intimate evening of innovative music Co-Curated by FONT (Festival of New Trumpet Music) and Sangha Member Ryuko Shragge Featuring: RPE duo and The Douglas Detrick Quartet. 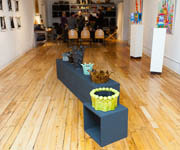 For the winter holidays the Village Zendo was transformed into the “Hello Zen” Holiday Market. 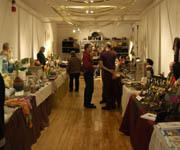 Sangha members and friends came together for a festive holiday market fundraiser filled with crafts and great food. VZ Arts is planning future marketplace events. If you are a crafter or artisan and are making items that would be appropriate for our spirtual community, please contact Musho.